The IEEE is the world's largest technical professional organization with over 400,000 members in more than 160 countries. Jefferies two-day visit to New Mexico included a tour of Los Alamos National Laboratory on Tues, Sept 25. On Wed, Sept. 26 Jefferies and "first spouse" Gloria Jefferies toured The School of Engineering. 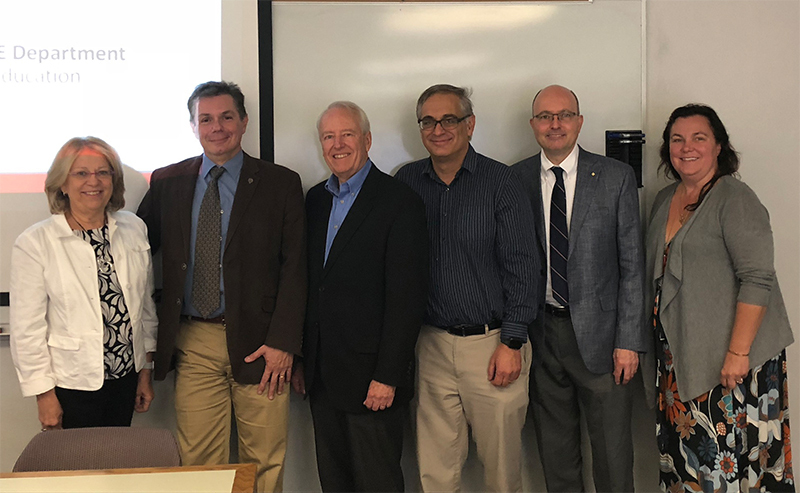 Jefferies met with Gabriel Lopez (Vice President for Research) Edl Schamiloglu (Associate Dean for Research), Michael Devetsikiotis (ECE Chair), Marios Pattichis (ECE Vice Chair), and ECE Research Professor Sandra Biedron ECE — who helped organize the New Mexico visit. Tours of various ECE-based research and development labs filled the guests’ morning, lead by Professors Edl Schamiloglu, Mark Gilmore, Sal Portillo, Jane Lehr and Eirini Eleni Tsiropoulou. More than 20 students from the local IEEE Student Chapter discussed their activities with Jefferies over lunch. Mr Jefferies then took the podium of the SOE auditorium and presented a lecture entitled, "IEEE and the Role of Professional Societies." Student, faculty and staff from UNM as well as the public and technical representatives from industry and the New Mexico laboratories were present to hear about the roots of the society that began back in 1884. Jefferies outlined the many roles of IEEE – organizing some 1800 conferences a year, curating over 4 million documents, operating over 200 top-ranked periodicals for the various fields of electrical engineering and beyond, maintaining over 1300 “standards” that shape our lives (such as how WIFI is operated). Jefferies went on to discuss other activities of IEEE including being a non-political global voice for public policy of science and technology, providing global humanitarian efforts based on technology solutions with the world experts, continuing education and certification, outreach and curricula for STEM, working groups on ethics in technology, and launching new initiatives that focus on today’s technical challenges or ethics concerns. A few numbers that caught the audience’s attention were that the IEEE STEM program “TryENgineering.org” had 23 Million downloads, trained 8200 teachers, and the estimate is that the program has reached over 500 Million students. Jefferies also outlined how a professional organization opens up opportunities for career pathways, building a variety of skills, networking. Mr Jefferies charts can be viewed by clicking on this sentence. Immediately following the lecture was a panel discussion on "Developing an Innovation Mindset Throughout a Career.” The panel members included Mr Jefferies, Dr Schamiloglu, Heather Quinn (R&D Engineer 5, ISR Division, Los Alamos National Laboratory), Randy Schunk (Manager, Advanced Materials Laboratory, Sandia National Laboratory), and Mark Curtin (Chief Scientist, Ion Linac Systems ionlinacs.com, Albuquerque). The panel members discussed the variety of roles and activities that they have assumed throughout their careers and that their best innovations were born from working outside of their comfort zones and taking risks. Many of the panelists cited that being part of a team is one of the most important components of great innovation, along with having a champion of your/your team’s work, as well as the funding required. The panel engaged in lively discussions with the audience of industry and lab personnel, UNM students, faculty and staff. The visit ended with informal discussions with the guests.